This article is about the character. For the video game series which features her, see Hatsune Miku: Project DIVA. In this Japanese name, the family name is Hatsune. The name of the character comes from merging the Japanese words for first (初, hatsu), sound (音, ne), and future (ミク, miku[n 1]), thus meaning "the first sound of the future", referring to her position as the first of Crypton's "Character Vocal Series". She was built using Yamaha's Vocaloid 2 technology, and later updated to newer engine versions. She was created by taking vocal samples from voice actress Saki Fujita at a controlled pitch and tone. Those samples all contain a single Japanese phonic that, when strung together, creates full lyrics and phrases. The pitch of the samples was to be altered by the synthesizer engine and constructed into a keyboard-style instrument within the Vocaloid software. Crypton released Hatsune Miku on August 31, 2007. Crypton had the idea to release Miku as "an android diva in the near-future world where songs are lost." Hatsune Miku was released for Vocaloid 3 on August 31, 2013, including an English vocal library. She was the first Vocaloid to be developed by the company, following their commercial release handle of Yamaha Corporation developed vocals "Meiko" and "Kaito", making her the third Vocaloid to be sold commercially by the company. On April 30, 2010, a new add-on for Miku, called Hatsune Miku Append, was released, consisting of six different timbres for her voice: Soft (gentle timbre), Sweet (young, chibi quality), Dark (mature and melancholic), Vivid (bright and cheerful), Solid (loud, clear voice), and Light (innocent and angelic). 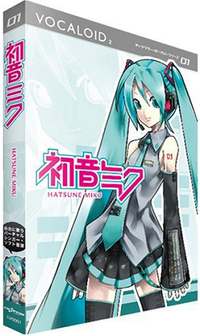 Miku Append was created to expand Miku's voice library, and as such requires the original program to be installed on the user's computer first. This was the first time a Vocaloid had such a release, and more Append versions were reported from Crypton Future Media at later dates. It was mentioned that a 7th Append voicebank, a falsetto voice, had been recorded; however, since the developers didn't think it would be useful on its own, no plans were made for an independent release. During the Kagamine Append development, a "darkish Whisper/Sweet" append was being considered. Miku's English vocal was also due for a Vocaloid 2 release, but it was not released in the engine due to low quality. To aid in the production of 3D animations, the program MikuMikuDance was developed by an independent programmer. The freeware software allowed a boom in fan-made animations to be developed, as well as being a boost for promoting Vocaloid songs themselves. This spawned "NicoNico Cho Party", where fans could submit their animations to accompany live holographic performances of popular Vocaloid songs. An English voicebank for Hatsune Miku was announced in 2011 and was to be released by the end of 2012. However, the decision to move to Vocaloid 3 and issues with English pronunciation delayed the release. It was finally released on August 31, 2013 via digital distribution. The Hatsune Miku Vocaloid 3 Japanese vocal library was released on September 26, 2013. It contained updates to all previous Vocaloid 2 vocals except Vivid and Light. These were later released separately, though they were initially offered to anyone who already owned Hatsune Miku, Hatsune Miku Append, and Hatsune Miku V3. Once imported into Vocaloid4, all Vocaloid3 Hatsune Miku vocals could use the new Cross-Synthesis system (XSY) built for the new engine. The voice was also imported into a device called Pocket Miku, released on April 3, 2014. Hatsune Miku received an update for Yamaha's Vocaloid 4 engine under the name of Hatsune Miku V4x. It makes use of the new EVEC system for Piapro Studio, a VSTi plugin used as an alternative to the traditional Vocaloid Editor. EVEC consists of recorded vowels. Along with the consonant, a different vocal tone can be achieved. Two vocal tones are included in the EVEC system: Power and Soft. Along with the new EVEC system, phoneme errors found in Miku's V2 and V3 voicebanks would be fixed allowing for easier manipulation of her voice. As of August 31, 2016[update], Hatsune Miku V4X/V4 English was released. A Mandarin Chinese voicebank was released in September 2017, making Hatsune Miku the first trilingual Vocaloid product. Her Chinese name is 初音未来 (pinyin: Chūyīn Wèilái); 未来 are the Chinese characters for her given name, Miku. Miku has been heavily promoted since 2008 and was originally aimed at professional musicians. On September 12, 2007, Amazon.co.jp reported sales of Hatsune Miku totaling 57,500,000 yen, making her the number one selling software of that time. She was the first vocal to be developed and distributed by Crypton Future Media and sung in Japanese. Her instant success is owed to Vocaloid being a cultural hit in Japan and she reportedly sold 40,000 units by July 2008, selling on average 300 units a week. By Jan 2011, she had sold 60,000 units. Since the success of her Vocaloid 2 package led to an expansion of marketing possibilities, most of the mass marketing has come after her initial release as a response to her popularity and has been on going since 2008. Even with the addition of other Character Vocals, Miku's name continues to be used as the primary source of marketing for Crypton Future Media, to the point where most products for their Vocaloid related products will usually only feature Hatsune Miku's name. In March 2012, the Nomura Research Institute estimated that the sales of all Hatsune Miku brand goods added up into the region of ¥10 billion since her release in 2007. Her name is easily the most recognizable of all Vocaloids. In 2011, Crypton began to focus on marketing Miku to United States audiences. On May 7, Amazon placed a preview of Supercell's hit song, "World is Mine", as a single. When the song finally went on sale, it ranked at No. 7 in the top 10 world singles list on iTunes in its first week of sales. Since Crypton had always sold Miku as a virtual instrument in Japan, they asked their Japanese fan base if it was acceptable for them to sell her as a virtual singer to the new market audience. The main purpose of the Miku English version is to allow Japanese producers to break into the western market and expand their audiences. In 2008, Good Smile Racing began the licensing of Hatsune Miku and other Crypton Future Media-related Vocaloid content. Studie, which participated in the 2008 and 2009 seasons using a BMW Z4 E86. Their car was painted in official Hatsune Miku art, and fan-derivative versions of Hatsune Miku in some races in the 2009 season. In addition for the 2008 season a group of Racing queens were seen in the pitstop of races. Dubbed the "MikuMiku Gals", the three girls were Rin Miyama, Riona Osaki and Hina Sato. In 2009 a new set of MikuMiku Gals were introduced; these girls wore outfits based on all three Character Vocal series females and not specifically Hatsune Miku alone. Hiroko Nagano, Atsuko and Ayami were the Racing Queens for the season. Team COX, participating in the 2010 season, which uses a Porsche 996 GT3 RSR (and will use a Porsche 997 GT3-R). Their car uses Racing Miku (an official Hatsune Miku derivative wearing an orange race queen suit) as their image. 2010 was also the first season to receive the first official "Racing Miku" derivative design, and from this season onward, the Racing Queens outfits were based on the season's derivative design. The designer of the 2010 outfit was illustrator Redjuice. Model ayami returned for this season as a Racing queen and was joined by fellow models Saki Tachibana and Shihomi Kogoshi. GSR and Studie with TeamUKYO was the sponsorship for the 2011 season. The designer of the 2011 Racing Miku derivative design was illustrator Yuichi Murakami. Model Ayami returned as a Racing Queen for the third time and Tachibana Saki returned for her second season. Haruka Aoi was the third Racing Queen to wear the Racing Miku 2011 outfit. GSR and Studie with TeamUKYO was continued as a sponsorship for the 2012 season. The Racing Miku design was illustrated by Gan for this season. The Racing queens for the season were returning models Tachibana Saki and Aoi Haruka, as well as new models Sena Kougami and Ayana Sato. Once again, the GSR and Studie with TeamUKYO sponsorship continued with the 2013 season. The Racing Miku design for the season was done by Mari Shimazaki. The illustrator of the official art was Saitom. Sena Kougami returned as a racing queen for this season and was joined by Tsukasa Arai and Elena Ishiguro. In 2013, the Sponsorship was expanded to featured a racing outfit in the Isle of Man motor cycling race, for this race Team Mirari were sponsored and a special design for the Racing Miku design adapted to suit the different spot. The Racing Miku design also was adapted for a "Sepang" version showing bare toned skin as part of showing good health and promoting the design as "the Angel of summer". The illustrator for the 2014 season was Oguchi, one of the 15 artists of Kantai Collection. The outfit is designed by Koyamashigeto, the art director of Kill la Kill. The machine version of the outfit is designed by Koyamashigeto and Shōji Kawamori, who is noted for his "Macross" designs. The Racing Queens who wore the outfit were returning models Tsukasa Arai and Sena Kougami, as well as new models Kelal Yamaura and Noa Mizutani. For the 2015 Racing Miku, the design was based on a "Princess Knight" complete with a shield and spear-like umbrella. The illustrator was Taiki, the lead visual design from Square Enix and Sega's games Lord of Vermilion and Rise of Mana. Koyamashigeto once again returned as the art direction and designer for the season. Tsuyoshi Kusano is in charge of the new machine design. Sapporo has been a major main target of sponsorship since 2010, with Crypton Future Media sponsoring the winter festivals. The image of Hatsune Miku would appear around the town on public transportation. The image portrayal of Miku that is used is a derivative design called "Snow Miku". Although originally, this was simply a recoloring of the normal Hatsune Miku, unique designs have occurred every year since 2011. Figurines based on the design have also been featured. The 2012 design was chosen via a contest. The winning entry was referred to as "Fluffy Coat Snow Miku". The 2013 design was called "Strawberry Daifuku Shiromuku Miku". The 2014 design was based on a Magical Girl design by dera_fury, who was the winner of the 2014 Snow Miku contest. The illustration was "Nekosumi". The design also featured a pet called "Rabbit Yukine". The 2015 design was called "Snow Bell Snow Miku" and was illustrated by Nardack. In 2012, several ice sculptures of the Character Vocal series and several snow sculptures of Miku were produced for the event. However, on February 7, 2012, one of the Snow Miku sculptures later collapsed and had to be rebuilt elsewhere with better support. The collapsed figure also hit a woman in her early 60s on the back of the head; no serious injuries were sustained in the process. Example of a song created using Vocaloid software with vocals by Hatsune Miku. During Miku's development, Crypton decided to take a different approach from that used by the other Vocaloid sound bank publishers. It was decided that to make the product successful not only would a highly appealing voice need to be developed, but that the voice needed an image. She was originally aimed only at professional producers; the amateur and otaku market had not fully formed yet, and so were not initially considered. The task for coming up with Miku's image went to the manga artist Kei Garō. When Kei designed Miku, his only direction was that she was an android and what her color scheme (based on Yamaha's synthesizer's signature turquoise color) was. The design on Miku's skirt and boots are based on synthesizer software colors and the bars represent the actual bars within the program's user interface. Miku was originally intended to have a different hairstyle, but Kei stuck to pigtails or bunches after trying them out. Crypton then officially created and posted Miku's personal data sheet. However, this only contained her 'physical' and technical traits; Crypton did not provide much information about Miku's personality, which has allowed song/music video creators and fans to choose the traits that they think suit her best. Nico Nico Douga, a Japanese website similar to YouTube, played a fundamental role in the recognition and popularity of the software. Soon after Miku's release, Nico Nico Douga users started posting videos of songs created using her sound bank. According to Crypton, a popular video featuring Miku's super-deformed alter ego Hachune Miku singing and dancing to "Ievan Polkka" while spinning a Welsh onion in homage to Loituma Girl's original video (which led to Miku also being commonly associated with spring onions) demonstrated the potential of the software in multimedia content creation. As Miku's recognition and popularity grew, Nico Nico Douga became a place for collaborative content creation. Popular original songs written by a user would inspire illustrations, animations in 2D and 3D, and remixes by other users. Some creators would show their unfinished work and ask for ideas. In September 2009, three figurines based on the derivative character "Hachune Miku" were launched in a rocket from the United States state of Nevada's Black Rock Desert, though it did not reach outer space. In late November 2009, a petition was launched in order to get a custom-made Hatsune Miku aluminium plate (8 cm × 12 cm, 3.1" × 4.7") made that would be used as a balancing weight for the Japanese Venus spacecraft explorer Akatsuki. Started by Hatsune Miku fan Sumio Morioka (also known as "chodenzi-P"), this project has received the backing of Dr. Seiichi Sakamoto of the Japan Aerospace Exploration Agency. On December 22, 2009, the petition exceeded the needed 10,000 signatures necessary to have the plates made. An original deadline of December 20, 2009, had been set to send in the petition, but due to a couple of delays in the Akatsuki project, a new deadline of January 6, 2010, was set; by this deadline, over 14,000 signatures had been received. On May 21, 2010 at 06:58:22 (JST), Akatsuki was launched, having three plates depicting Hatsune Miku and Hachune Miku in several monochrome images, composed of the miniature letters of the messages from the petition form etched in the plates. The UK 59th issue of the music and fashion magazine Clash featured Hatsune Miku as their cover star (using a real-life photo model), with a full feature on her. The Vocaloid software has also had a great influence on the character Black Rock Shooter, who looks like Hatsune Miku but is not linked to her by design. The character was made famous by the song "Black Rock Shooter", and a number of figurines have been made. An original video animation made by Ordet was streamed for free as part of a promotional campaign running from June 25 to August 31, 2010. A televised anime series aired in February 2012. In October 2011, Crypton showed on the official Hatsune Miku Facebook page a letter from the Japanese Minister of Economy for "contributing to the furtherance of the informatization by minister of economy." Geoffrey Cain of GlobalPost has argued that the phenomenon of Hatsune Miku is partly due to the love of Japanese for giving inanimate objects a soul, which is rooted in Shintoism or animism, but also in the long tradition of Karakuri ningyō or automated wooden puppets. Thus, Japanese are much more ready to accept a virtual character as "human". Miku's popularity has seen various references to her in anime. Miku is the protagonist of a manga series named Maker Hikōshiki Hatsune Mix, written by Kei Garō. The manga explores the many possibilities of story-telling and has featured numerous adventures, ranging from giant-sized battles with Hatsune Miku to home exploits. There is therefore no single storyline, and the entire setting within the manga is unofficial. During an episode of Zoku Sayonara, Zetsubou Sensei, Miku is seen auditioning for the voice of Meru Otonashi (Kagamine Rin and Len are referenced in the same episode). Miku's voice is used in one of the ending themes for the anime series Akikan! (episode 12). Moreover, she also sings the ending theme for the anime Yamishibai: Japanese Ghost Stories, called "Kaikai Emaki" (怪々絵巻). During an episode in the Lucky Star OVA, Kagami Hiiragi gets magically transformed into Miku cosplay. A character in the anime Kämpfer appears dressed as Miku in episode seven. She also appeared in the large plasma screen in Chrome Shelled Regios as an endorser. She also appears in episode 11 of Baka and Test as a member of class B. Miku also appears in Maria Holic episode 12, when the class is told they have a swim meet. Miku also appears in episode 1 of Himōto! Umaru-chan, in an imagination of what the main character wants to buy. A parody of Miku is also seen in Gintama (episode 237) in the second editor of Gintaman, Daito's anime fantasies. A series of rhythm games starting from Hatsune Miku: Project DIVA were produced by Sega under license using Hatsune Miku and other Crypton Vocaloids, as well as "fan-made" Vocaloids like Akita Neru. TinierMe also made attire that looks like Miku's for their services, allowing users to make their avatar resemble her. The series has sold 6 million copies. Hatsune Miku and Future Stars: Project Mirai was developed for the Nintendo 3DS. Miku's appearance in this game is based on the Nendoroid series of figures. Hatsune Miku is also briefly referenced in the game Recettear, where a young man stargazing sees "The Green-Onion Girl" constellation. Also, in 2013, Saki Fujita voices Fei-Yen HD, a character based on one of Hatsune Miku's modules, in Super Robot Wars UX; this appearance does not use Miku's vocal library. Miku's clothes appear as a costume for a playable character in the Japanese version of PangYa and was the back-up vocal for the game's season four trailer, as a downloadable costume for Sophie in Tales of Graces and is seen during a stage in the game 13-sai no Hellowork DS. Miku's clothes also appear in Phantasy Star Portable 2 as a costume for the player's female character, as well as her hairstyle and leek-themed weapons. Miku appears in the PlayStation 3 version of The Idolm@ster 2 as downloadable content. In the video game Skullgirls, one of Filia's alternative colors is based on Miku. Miku has appeared as downloadable content using the game engine M.U.G.E.N. Hatsune Miku's attire has also appeared in Phantasy Star Online 2 as a female character's costume, along with "Miku Dayō" as a Mag Design. She also makes an appearance in the game Brave Frontier. In 2014, Korg introduced "Miku Stomp", a guitar effects unit that emulates the sound of Miku's voice. "Tell Your World" by Livetune, which features her as a featured artist, appears in Japan's Just Dance Wii U. In 2015, "Ievan Polkka" was announced to appear in Just Dance 2016 along with a dancer whose outfit is exactly like Miku's. 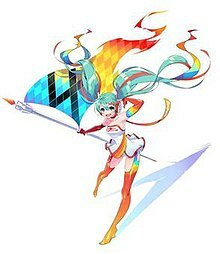 On July 23, 2015, Miku was announced as a DLC character in Persona 4: Dancing All Night, a video game released in 2015 for the PlayStation Vita and developed by Atlus. On November 26, 2015, Miku became a collaboration idol for the second update of the 2016 series of the Aikatsu! arcade game. Several cards containing Hatsune Miku uniforms were also included for the update. In 2016, a remix of "Ievan Polkka" appeared on an LG G5 commercial. "PoPiPo" was announced to appear in Just Dance 2017 also with a dancer whose resembles Miku. Then, "Love Ward" was also announced to appear in Just Dance 2018 with the same Miku-resembling dancer. In March 2017, Miku was introduced as a playable character in the mobile game '#COMPASS'. In fall 2017, Hatsune Miku was added as a playable character in PriPara. In August 2017, to celebrate the 10th anniversary of the virtual singer, Ricoh released a limited edition of its 360° camera Ricoh Theta branded with Hatsune Miku imagery called the Ricoh Theta SC Type Hatsune Miku. The Ricoh Theta Type Hatsune Miku mobile apps (iOS and Android) allow for placing images of the character (in 55 different poses) within 360° images taken with the camera. Users can manipulate Hatsune Miku's facial expressions, change the direction of the character's shadow and hair, and rotate the character to place it within the 360° image. The product includes a specially designed case and other features illustrated by Fuzichoco, an illustrator at Crypton Future Media. In August 2010, over 22,000 original songs had been written for Hatsune Miku. Later reports confirmed that she had 100,000 songs in 2011 to her name. Crypton's website promotes Miku's popularity having her voice used in over 100,000 unique songs. One of the Vocaloid compilations, Exit Tunes Presents Vocalogenesis feat. Hatsune Miku, debuted at number-one on the Japanese weekly Oricon album charts dated May 31, 2010, becoming the first Vocaloid album ever to top the charts. Another album, Supercell, by the group Supercell also features a number of songs using Vocaloids. Other albums, such as 19's Sound Factory's First Sound Story and Livetune's Re:package, and Re:Mikus also feature Miku's voice. Other uses of Miku include the albums Sakura no Ame (桜ノ雨) by Absorb and Miku no Kanzume (みくのかんづめ) by OSTER-project. She had sung the original Nyan Cat called "Nyanyanyanyan!" by daniwell-P. Kagamine Len and Rin's songs were covered by Asami Shimoda in the album Prism credited to "Kagamine Rin/Len feat. Asami Shimoda". Another song original sung by Miku, "Color", was covered by Maria, and featured as the opening theme of the 2011 anime series Freezing. As a virtual idol, Hatsune Miku performed her first "live" concert during Animelo Summer Live at the Saitama Super Arena on August 22, 2009. Miku later returned to Animelo Summer Live 2012: Infinity to perform "World is Mine" and "Tell Your World". Miku also performed her first overseas live concert on November 21, 2009, during Anime Festival Asia (AFA) in Singapore. On March 9, 2010, Miku's first solo live performance titled "Miku no Hi Kanshasai 39's Giving Day" was opened at the Zepp Tokyo in Odaiba, Tokyo. Miku performed in the United States on July 2, 2011 at the Nokia Theater at L.A. Live during the 2011 Anime Expo in Los Angeles. The concert followed the same format as the previous "39's Giving Day" concert. Hatsune Miku performed in Japanese rock festival Summer Sonic 2013 on August 10, 2013. Hatsune Miku teamed up with designer Louis Vuitton and director Toshiki Okada for a Vocaloid opera, titled The End. It featured no human singers and took place at the Theatre du Chatelet Opera House in Paris on November 13 and 15, 2013. Another operatic work starring Hatsune Miku, a short opera buffa entitled "Weebmalion", appeared in 2018, this time featuring a real solist, tenor Aleksander Kunach, singing with her in a love duet written by Polish composer, Krzysztof Żelichowski. It was the first time a classically trained voice appeared alongside Vocaloid in original classical composition. A young male prototype used for the "Project If..." series was used in Sound Horizon's musical work "Ido e Itaru Mori e Itaru Ido", labeled as the "prologue maxi". The prototype sang alongside Miku for their music and is known only by the name "Junger März_Prototype β". Hatsune Miku was the opening act for Lady Gaga's world tour ArtRave: The Artpop Ball, performing throughout the first month of her tour from May 6 to June 3, 2014. In March 2014, Hatsune Miku and Crypton Future Media teamed up with the Japanese band Bump of Chicken to record a music video featuring a real band singing alongside Hatsune Miku in real time. This video was uploaded on March 12, 2014, and contains the song "Ray". The video is not after-edited in any way. This was made possible by Crypton's newest technology to focus characters on a screen directly to the recording camera by using a big curved screen, motion data, Wifi-sensors, movement-sensors and some older technology from Crypton. Pharrell Williams made a remix of Livetune's song "Last Night, Goodnight" featuring Hatsune Miku. On October 8, 2014, Miku made her American network television debut as she performed "Sharing the World" on the Late Show with David Letterman on CBS. Hatsune Miku is featured in "B Who I Want 2 B" produced by Sophie from Namie Amuro's album Genic. The 2016 Hatsune Miku Expo tour featured American electronic band Anamanaguchi as an opening act; to commemorate the tour, the band recorded a single track titled "Miku", which they performed live on the tour with Miku as an encore song. Big Boi (of Outkast) sampled Aura Qualic's song "DATA 2.0", featuring Hatsune Miku for his 2017 single "Kill Jill", also appearing in the song's music video. 1 Miku is a nanori reading of the word for future, 未来, normally read as mirai. These are the same characters used in Miku's Chinese name, 初音未来 Chūyīn Wèilái. ^ "Japanese pop star Hatsune Miku takes the stage -- as a 3D hologram". Los Angeles Times. November 10, 2010. Retrieved November 13, 2010. ^ a b "Who is Hatsune Miku?". Crypton Future Media. Retrieved March 7, 2013. ^ "英語に苦心　大人なVOCALOID「巡音ルカ」ができるまで (1/2)". ITmedia ニュース. Retrieved April 27, 2016. ^ 初音ミクが未来から来ない?来た? [Did Hatsune Miku Come From the Future? Came From?] (in Japanese). P-tina. November 9, 2007. Archived from the original on May 1, 2008. Retrieved October 5, 2010. ^ "Piapro Hatsune Miku V3". Crypton Future Media. Piapro Studio. Retrieved October 18, 2013. ^ "初音ミク 6th Anniversaryニコ生で「初音ミク誕生までと、これから」特集" (in Japanese). Hatsune Miku Miku. September 4, 2013. Retrieved July 26, 2014. ^ "初音ミク・アペンド（Miku Append）" [Hatsune Miku Append (Miku Append)] (in Japanese). Amazon.co.jp. Retrieved April 30, 2010. ^ "Miku Append" (in Japanese). Crypton Future Media. Retrieved November 8, 2010. ^ "Crypton's Twitter page" (in Japanese). Twitter. Retrieved July 8, 2010. ^ "crypton_wat". Twitter. Retrieved April 27, 2016. ^ Wataru Sasaki [crypton_wat @vocaloid_cv_cfm] (December 1, 2011). "おお、答えれていなかった質問が幾つかありました。現状、betaとして出ている音源については全てVOCALOID2を使用したものでして、原則、VOCALOID3に適合させた上で改めて音声化し、デモソング等としてリリースさせて頂きたいと思います m(_ _)m" [Oh, several questions have been left unanswered. Status quo, all sound sources released as beta are made with VOCALOID2, and in principle, these should be adopted to VOCALOID3, then rendered using it, and finally we will release these as demo songs. m(_ _)m]. Twitter (in Japanese). Crypton Future Media. ^ "Vocaloid Promotion Video Project". MikuMikuDance. Geocities. Retrieved July 9, 2010. ^ Jrharbort. "Miku & Kaito News Blip From The NYCC". Mikufan. Retrieved December 26, 2012. ^ "ポケット・ミク買ってきた". Retrieved April 27, 2016. ^ "初音ミクV4 TEST：開発状況レポート＠2015.04.24". Sonicwire Blog. wat. Retrieved February 20, 2016. ^ "[Vocaloid2情報]企画制作時の悩みと答え（後半）". Retrieved April 27, 2016. ^ 異例の売れ行き「初音ミク」　「ニコ動」で広がる音楽作りのすそ野 [Unprecedented Demand for "Hatsune Miku"; the Music Maker Spread on Nico Nico Douga] (in Japanese). IT Media. September 12, 2007. Retrieved November 15, 2010. ^ Okada, Yuka (July 23, 2008). "「初音ミク」発売からもうすぐ1年　開発者が語る、これまでとこれから" [Hatsune Miku's Release 1st Anniversary, soon. The developer (Wat) talked: Until Now, and the Future] (in Japanese). ITmedia. ^ JR (June 1, 2011). "Virtual star to be unleashed on US". The Independent. Archived from the original on June 11, 2011. The Hatsune Miku software has sold a remarkable 60,000 copies to date, making it a huge hit in a market where sales of 1,000 markets of a synthesizing software is considered a success. ^ "初音ミク、"リアル"に商機　ライブ・カラオケ・ＣＭ…関連消費１００億円超" [Hatsune Miku and related merchandise have raised over 10 billion yen in revenue]. Sankei Biz News (in Japanese). March 27, 2012. Retrieved October 10, 2015. ^ "ボーカロイドに関する調査" [Survey On Vocaloids] (PDF). Tokyo Polytechnic University (in Japanese). February 26, 2013. Retrieved October 10, 2015. ^ Loo, Egan (May 16, 2011). "Supercell/Miku Song in U.S. iTunes' World Top 10". Anime News Network. Retrieved October 10, 2015. ^ "crypton_wat on Twitter – Tweet". Twitter. May 10, 2011. Retrieved October 10, 2015. ^ "The Rumored No. 808 Hatsune Miku Studie Glad BMW Z4 Latest News" (in Japanese). Super GT.net. August 18, 2008. Archived from the original on August 23, 2008. Retrieved August 21, 2008. ^ "Itasha storm in Super GT. Report of Final Race at Mt. Fuji (Page 3)" (in Japanese). ASCII. November 11, 2008. Retrieved November 16, 2008. ^ "キャラホビ2008行ってきた" [Went to the Karaoke 2008 Show]. パニオンギャルを撮ル！ 2nd – Blog (in Japanese). August 31, 2008. Retrieved October 10, 2015. ^ "SGTを振り返ってみた[Rd.8オートポリス]" [Looking back on SGT Rd.8 Autopolis]. Good Smile Racing (in Japanese). November 27, 2009. Retrieved October 10, 2015. ^ "嘆願書はもういらない！　初音ミクZ4、富士で完走！" [No more petitions! Hatsune Miku Z4, finish at Fuji!]. ASCII (in Japanese). May 8, 2009. Retrieved October 10, 2015. ^ "怒濤の追い上げでミクポルシェ、10位でフィニッシュ！" [Miku catches up in the wake of Porsche! 10th at the finish!]. ASCII (in Japanese). April 6, 2010. Retrieved October 10, 2015. ^ "撮影日和…？　[写真]" [Photoshooting weather is...? (Photo)]. Ogikubo Blog (in Japanese). April 25, 2011. Retrieved October 10, 2015. ^ "GT300の痛車といえばやっぱりコレ。初音ミクレースクイーン特集【スーパーGT第4戦・SUGO】" [GT300 Itasha Discussion. Hatsune Miku Race Queen Special]. clicccar.com (in Japanese). August 7, 2012. Archived from the original on April 13, 2013. Retrieved October 10, 2015. ^ "島崎麻里さんの設定画公開！" [Shimazaki Mari's setting images published!]. Good Smile Racing (in Japanese). September 25, 2013. Retrieved October 10, 2015. ^ "【再掲】島崎麻里さんのレーシングミク" [[Reprinted] Shimazaki Mari's Racing Miku]. Good Smile Racing (in Japanese). August 28, 2013. Retrieved October 10, 2015. ^ "Collection of Race Illustrations by saitom – Part 2". Good Smile Racing. October 21, 2013. Retrieved October 10, 2015. ^ "SUPER GT2013 第2戦 富士 GSR 初音ミク BMWのレースクイーンさん" [SUPER GT2013 Round 2 – Fuji GSR Hatsune Miku BMW Race Queens]. ☆しのぶ☆のブログ (Shinobu☆Blog) (in Japanese). May 29, 2013. Retrieved October 10, 2015. ^ "EVバイク✕レーシングミクでマン島TTに挑戦する - Komatti-Mirai Racing" [Isle of Man TT Racing Challenge EV bike ✕ Racing Miku – Komatti-Mirai Racing]. Good Smile Racing (in Japanese). Archived from the original on November 13, 2013. Retrieved October 10, 2015. ^ "ビキニで色黒！　南国専用のレーシングミク誕生！" [Dark complexion bikini! Birth of the tropical Racing Miku!]. ASCII (in Japanese). June 7, 2013. Retrieved October 10, 2015. ^ "レーシングミク2014 ver. のイラストに『艦これ』ヲ級を描く絵師おぐち氏を起用！！デザイン『キルラキル』コヤマシゲト氏、車体機構デザイン『マクロス』河森正治氏" [Racing Miku 2014 ver. illustration in Kancolle style – Machine version by Kill la Kill's Koyamashigeto and Macross's Shoji Kawamori]. kantama.net (in Japanese). December 23, 2013. Retrieved October 10, 2015. ^ "ついにBMWからチェンジ！ ミクGT、2015年の参戦体制を発表！" [Finally an update from BMW! Miku GT 2015 racing order announced!]. ASCII (in Japanese). December 23, 2014. Retrieved October 10, 2015. ^ "結果発表 - 菜々香さん" [Results Announcement – Nanaka-san]. Crypton Future Media (in Japanese). Piapro Studio. Retrieved October 10, 2015. ^ "SNOW MIKU 2013". Crypton Future Media (in Japanese). Archived from the original on March 11, 2017. Retrieved October 10, 2015. ^ "【お知らせ】雪ミク2013年度衣装決定！そしてミクパが台湾と香港で開催決定！" [[News] Snow Miku 2013 costume decision! Also, design chosen in Taiwan and Hong Kong!]. Crypton Future Media (in Japanese). Piapro Studio Hatsune Miku Blog. June 28, 2012. Retrieved October 10, 2015. ^ "Nendoroid Snow Miku: Magical Snow Ver". Good Smile Company. February 2014. Retrieved October 10, 2015. ^ "SNOW MIKU 2015". Crypton Future Media (in Japanese). Retrieved October 10, 2015. ^ "公式の「雪ミク」の雪像が倒壊してしまったらしい件" [Official Snow Miku sculpture has collapsed]. vocaloid.blog120.fc2.com (in Japanese). February 7, 2012. Retrieved October 10, 2015. ^ "祝！公式の「雪ミク2012」の雪像が復活！" [Congratulations! The official "Snow Miku 2012" Snow Sculpture is back!]. vocaloid.blog120.fc2.com (in Japanese). February 11, 2012. Retrieved October 10, 2015. ^ "(Vocaloid2情報)企画制作時の悩みと答え(後半)" (in Japanese). Crypton Future Media. May 25, 2007. Retrieved August 11, 2013. ^ "What is the "HATSUNE MIKU movement"?" (PDF). Crypton Future Media. Archived from the original (PDF) on March 11, 2012. Retrieved March 16, 2013. ^ "How Hatsune Miku opened the creative mind: Interview with Crypton Future Media" (in Japanese). IT Media. February 25, 2008. Retrieved February 29, 2008. ^ "DTM in the boom again: How anonymous creators are discovered by Hatsune Miku" (in Japanese). IT Media. September 28, 2007. Retrieved February 29, 2008. ^ "Hachune Miku Figure to Ride Rocket from Nevada This Month". Anime News Network. September 8, 2009. Retrieved July 14, 2010. ^ "「あなたも宇宙開発を」　"初音ミク衛星"打ち上げ目指す「SOMESAT」" ["You Too Will Explore Space" Aiming to Launch the "Hachune Miku Satellite" "SOMESAT"] (in Japanese). IT Media. October 8, 2009. p. 1. Retrieved July 14, 2010. ^ 金星探査機「あかつき」に初音ミク絵を搭載する署名 [Sign to Get Hatsune Miku Image on Board Venus Explorer Akatsuki] (in Japanese). Google. Retrieved December 18, 2009. ^ 初音ミク搭乗の「あかつき」、打ち上げに再チャレンジ ["Akatsuki", Ridden by Hatsune Miku, Challenges to Be Launched Again] (in Japanese). IT Media. May 20, 2010. Retrieved May 28, 2010. ^ 初音ミクついに宇宙へ！　「あかつき」打ち上げ成功 [Hatsune Miku Eventually Goes to the Space! "Akatsuki" Was Successfully Launched] (in Japanese). IT Media. May 21, 2010. Retrieved May 28, 2010. ^ "Pixel Perfect – Meet Hatsune Miku". Clash. February 2, 2011. Retrieved February 2, 2011. ^ "ブラック★ロックシューター :: supercell" [Black Rock Shooter :: supercell] (in Japanese). Supercell. Retrieved July 8, 2010. ^ "Black Rock Shooter Anime to Be Streamed for Free". Anime News Network. March 23, 2010. Retrieved July 8, 2010. ^ "TV Animation Black Rock Shooter | On Air". Noitamina. Retrieved February 16, 2012. ^ Cain, Geoffrey (April 10, 2014). "Japan's biggest pop star right now is a fetishized hologram". GlobalPost. Retrieved April 26, 2014. ^ "Hatsune Miku x TinierMe Gacha". Gcrest Entertainment. Retrieved July 23, 2010. ^ "Hatsune Miku to Appear in American MMO TinierMe". Anime News Network. July 21, 2010. Retrieved July 23, 2010. ^ Romano, Sal (October 12, 2018). "Sega shares updated sales numbers for Persona, Megami Tensei, Yakuza, and more; aiming for simultaneous worldwide releases". Gematsu. Retrieved October 13, 2018. ^ "Nintendo Announces Monster Hunter 4, Hatsune Miku Games for 3DS". Anime News Network. September 13, 2011. Retrieved September 13, 2011. ^ "The Idolm@ster 2 PS3 Port to Feature Hatsune Miku Herself". Anime News Network. October 4, 2011. Retrieved October 5, 2011. ^ "Hatsune Miku Joins Phantasy Star Online 2". Anime News Network. Anime News Network. March 18, 2013. Retrieved September 18, 2013. ^ "Hatsune Miku Is Popping Into Brave Frontier". Siliconera. October 9, 2014. Retrieved October 20, 2014. ^ "Miku Stomp". Korg. Retrieved March 6, 2015. ^ "P4Dに初音ミク参戦！8月中旬、追加楽曲配信決定！". ATLUS. July 23, 2015. Retrieved August 19, 2015. ^ "Ricoh Theta SC Type Hatsune Miku Will Be Released". Ricoh. Retrieved August 8, 2017. ^ "RICOH THETA SC model branded with Hatsune Miku imagery". RICOH. Retrieved August 8, 2017. ^ "Hands-On Review of Ricoh Theta SC Type Hatsune Miku Camera and App". Ricoh. Retrieved April 3, 2018. ^ "Who is Hatsune Miku?". Crypton Future Media. Retrieved May 11, 2013. ^ 初音ミク"ボーカロイドアルバム"が徳永を押さえ、初首位 [Hatsune Miku "Vocaloid Album" Reaches #1 for the First Time Overtaking Tokunaga]. Oricon Style (in Japanese). Oricon. May 25, 2010. Retrieved July 1, 2010. ^ "supercell feat.初音ミク 1st Album "supercell" Special WEB" [Supercell feat. Hatsune Miku 1st Album Supercell Special WEB] (in Japanese). Supercell. Retrieved March 24, 2010. ^ Yamada, Keisuke (2017). Supercell ft. Hatsune Miku. New York: Bloomsbury. ISBN 9781501325977. ^ "First Sound Story" (in Japanese). Amazon.co.jp. Retrieved July 8, 2010. ^ "livetune feat.初音ミク specialsite" [livetune feat. Hatsune Miku specialsite] (in Japanese). Victor Entertainment. Retrieved July 8, 2010. ^ "Re: Mikus" (in Japanese). Livetune. Retrieved July 8, 2010. ^ "下田麻美「Prism/鏡音リン・レン feat. 下田麻美」の収録曲が明らかに" [The Songs on Asami Shimoda's "Prism/Kagamine Rin/Len feat. Asami Shimoda" Are Revealed]. Mycom Journal (in Japanese). Mainichi Communications. May 22, 2009. Archived from the original on July 18, 2010. Retrieved July 23, 2010. ^ "Hatsune Miku Virtual Idol Performs 'Live' Before 25,000". Anime News Network. August 23, 2009. Retrieved August 26, 2009. ^ 影山、堀江、初音ミクも！「アニサマ」出演者追加 [Also Kageyama, Horie and Hatsune Miku! Performers for "Anisama" Are Added]. Oricon Style (in Japanese). Oricon. August 6, 2009. Retrieved July 15, 2010. ^ "Virtual Idol "Hatsune Miku" to perform overseas at "I LOVE anisong" stage!". Anime Festival Asia. Retrieved November 24, 2009. ^ 「電子の歌姫」初音ミクが海外初公演 ["Electronic Diva" Hatsune Miku's First Oversea Concert Is Held] (in Japanese). Nikkan Sports. November 21, 2009. Retrieved July 15, 2010. ^ "Hatsune Miku Virtual Idol to Hold 1st Solo Concert". Anime News Network. December 10, 2009. Retrieved July 15, 2010. ^ 初音ミクによるソロコンサートが開催、39個の秘密も明らかに [Hatsune Miku Performs A Solo Concert, And 39 Secrets Are Revealed] (in Japanese). Famitsu. March 10, 2010. Retrieved July 15, 2010. ^ "Japan's Virtual Pop Star Hatsune Miku To Make U.S. Concert Debut At Anime Expo 2011". Anime Expo. May 12, 2011. Archived from the original on May 16, 2011. Retrieved May 18, 2011. ^ "Louis Vuitton And Marc Jacobs To Team Up With Hatsune Miku". Japanverse. November 22, 2012. Archived from the original on February 3, 2013. Retrieved April 5, 2013. ^ "「イドへ至る森へ至るイド」 Vocals & Voices の発表!!" ["Ido e Itaru Mori e Itaru Ido" Vocals & Voices Announcement!!] (in Japanese). Sound Horizon. June 7, 2010. Archived from the original on December 2, 2006. Retrieved July 28, 2010. ^ "Project if...Crypton". Crypton Future Media (in Japanese). Twitter. June 7, 2010. Retrieved July 28, 2010. ^ "Hatsune Miku to Open For Lady Gaga". Anime News Network. April 16, 2014. Retrieved April 16, 2014. ^ "Pharrell And Hatsune Miku, Together At Last". Kotaku. May 14, 2014. Retrieved May 16, 2014. ^ "Hatsune Miku: "Sharing the World" - David Letterman". CBS. October 8, 2014. Retrieved October 9, 2014. ^ "Talking to Anamanaguchi about touring with virtual pop star Hatsune Miku". The Verge. Retrieved November 2, 2016. ^ "Hatsune Miku Sampled In Song From Big Boi, Killer Mike, Jeezy". Crunchyroll. April 22, 2017. Retrieved June 11, 2017. ^ "Miku". Behind the Name. Retrieved October 5, 2010.